I keep reading that this upcoming draft is full of potential superstars. I don't watch of ton of college ball until March, so who are the players to watch? With Dallas looking like it will have a high pick I'd like to have a few names to keep an eye on. Last edited by Underdog; 11-19-2016 at 08:00 PM. I haven't decided who my favorite is. I like basically all the pg's and combo guards at the top for different reasons. Draft is so loaded... All of those guys could be in top 10, really no reason we wouldn't get one of them. There is also a Senior pg who could be available top of the 2nd round if we didn't go pg in the first. Josh Jackson has the tools to eventually be a star but it might take some time. Probably has more upside than the PGs but I agree with UD that Dennis Smith is the guy we should take if available. I'm hearing Rose comparisons as well as CP3. Jackson is compared to Wiggins and McGrady. If we happen to slide down to mid-lottery I'd be tempted to take OG Anunoby. Extremely gifted 6'8" SF from Indiana who could be a sleeper in the draft. Last edited by rimrocker; 11-19-2016 at 09:55 PM. We should also consider Fultz. Smith has higher upside, but Fultz is more skilled (and has been absolutely scorching hot to start the season). I don't think we can go wrong. I don't think so either but Smith has playmaking and scoring skills of CP3 with the athleticism and size of Rose. Yeah, torn ACL is not that welcoming and you have to be wary of those things. I would just like to mention also Lauri Markkanen. This should be his first season in USA. Just picked that spot in the video to show driving capabilities. In that game he has many times where he is open for three and nobody passes. Guy reminds quite a bit Dirk. Now, I do not think he will go that high. Lottery at best, maybe late first round. That is why I wish Mavs would somehow get another first round pick... Perhaps for Bogut. Not a huge fan of Ball... his shot is just plain ugly meaning he won't be able to penetrate the way he does in college at the NBA level. I only looked at Fultz, Smith, ball so far. My money is on Fultz. Smith looked great if he's auditioning for the and1 tour. Id have to see college tape to get an accurate assessment. Fultz shot looks way better and had a really nice all around game. And ball, that guys highlights are fun to watch, great vision for a pg, but I wonder about his jumpshot. But hes fast and can get in the lane. Last edited by Melonhead; 11-20-2016 at 12:18 PM. Fultz highlights.... kid has an advanced offensive game... he's my #1. Edit #1: If you don't have time to watch the whole video fast forward to minute 4 and watch him spin into an up and under and finish. He seriously has game. Edit #2: I seriously have a mancrush on this kid. I know people think Smith is more athletic but Fultz has something that is so hard to find -- the ability to control his athleticism and vary speeds. Check out dunk at 4:25. Edit #3: Last one I promise. As long as we're tanking let's make sure we get that #1 pick and take this kid. He's a franchise player. Last edited by tap2390; 11-21-2016 at 02:57 PM. Yeah Fultz is my favorite. I think his floor is higher than the others. It's possible though that Smith and Ball if they learn to shoot have higher ceilings though. That's why I won't be too disappointed if we get any of them at this point. It's still early, but if Fultz keeps playing the way he has been in these first 3 games he's my favorite. I'm a big fan of Fultz too... Really, either Dennis Smith or Markelle Fultz are are lightyears better than what we're rolling with right now -- no reason we can't bag a franchise PG with a lotto pick this year. I like a lot of the forwards out there too, but we have less need with Barnes on the roster. What do you guys think of Lonzo Ball? Am I the only one who sees a bit of Ricky Rubio in him? Excellent passer, solid defender, horrid shooter... Could work in the right lineup, but you really need to surround him with scorers. Not sure if I'd take him with a lotto pick, but I'd consider him in the next tier if that's where we landed. Last edited by Underdog; 11-21-2016 at 10:27 PM. I think he's got the ugliest jump shot in recent memory. But I'd be fine with him if Fultz and Smith were gone. But I also view jumpshot as something that's correctable. Last edited by Underdog; 11-21-2016 at 10:28 PM. Giles or Jackson is probably my #2 over Smith. The problem with Smith is his reliance on athleticism and lack of size. I could see him topping out as a better finishing Darren Collison. (Btw I fully admit I said in another thread Dennis Smith was the right guy to pair with Barnes). If he wants to grow homeless style beard or play that disgusting style Harden wants to play by baiting refs for calls and playing no defense then I'm out on Fultz. That's not what this guy ment obviously with the comparison but I just want to be clear.... talk about a buzz kill mentioning that name of all names. His would require a complete overhaul. It can be corrected but itd take years. Yeah it would take time, and he could never get better tbh, but he could develop other areas in the meantime(like mid range or post game), he has value outside of being a scorer so I would be fine if we got him if others were gone is all I am saying right now. He's not a top 5 pick to me, if we were in the top 5 I'd go elsewhere. Not going to lie BDub, I love Harden's game and wish he was here. I definitely agree with you that Ball is in the second tier of players. I can't think of an elite passing point who succeeds without a jumper. Pre-injury Shaun Livingston? Last edited by tap2390; 11-22-2016 at 02:50 PM. Not going to lie BDub, I love Harden's game and wish he was here. 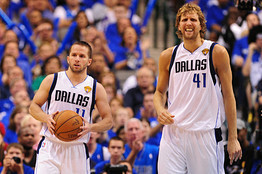 I'd really like to see the Mavs start moving guys for as many draft picks as possible. Stock piling 2nd round picks (or late first rounders) could come in handy on draft day if we want to move up on the board. The more I read and hear about Fultz the more I'm impressed and think he'd be great in Rick's system. If we don't trade Bogut for a pick Donnie has failed as a GM. If I was him I'd be on the phone with Danny Ainge asking about one of their 1st round picks. I may be reaching here but I could see some contenders having interest in Mejri, JJ and DWill (if healthy). We should be getting as many picks as possible over the next few months even if we have to take on a few garbage contracts. Its not like we're going to be signing any big FAs next off-season. Yeah I don't see how Bogut has shown anything remotely close to being worth a 1st. The only way we get a 1 is if we took a bad contact back I think. Maybe we could package him and get a heavily protected future first but by himself the only way I think would be to take back a bad contract. Which I'm not opposed to I might add. They might if they think a defensive minded big is the key piece to making a long playoff run. I'm not asking for the Nets 1st rounder, but asking for their or Memphis' would be something to consider. I'm sure they'd have to toss in something to make salaries match. Mavs need to go high risk, high reward no matter what position they pick. Getting a player that is going to contribute right away versus raw potential would be a big mistake. That's why if Smith is on the board, then you take him no questions asked. I think he without a doubt has the highest longterm star potential after Jackson. Honestly though, Jacksin, Fultz, or Smith are all high potential star picks. Can't really go wrong with any of them. I'm less enthusiastic about Ball since he won't really fit a team with no offensive players. Honestly though, Jacksin, Fultz, or Smith are all high potential star picks. Can't really go wrong with any of them. . Yes this is exactly correct. I will be upset if we play ourselves out of a top three pick because those are likely the first three off the board. They're the tier one guys. One team front-office executive told me that he thinks Dallas will tank only if it finds out Dirk isn’t effective or healthy enough to play every game. If that happens, there would be “plenty” of interest in center Andrew Bogut. Though Bogut turns 33 this season, he’s still an elite rim protector and rebounder who would boost a team’s playoff chances. If the Mavericks were able to acquire valuable assets for a pending free agent in Bogut, and then hit it big in the draft, they would have a nice blend of talent moving forward. I'm not sure how much stock to put into "one team front-office executive" admittedly. Here's some good articles on some of the draft prospects at the top. Last edited by Bryan_Wilson; 11-23-2016 at 01:57 PM. Last edited by tap2390; 11-23-2016 at 02:00 PM. Bogut does have value for contenders this year, but I haven't been able to locate a situation/ trade that works. The Cavs and Celtics seem like the obvious choices but the only possibility I see is Bogut + young'n for Amir Johnson + second round pick, or so. Last edited by Bryan_Wilson; 11-23-2016 at 02:19 PM. Maybe some of you GMers can help me out here. Maybe I'm missing something but it just seems that Mejri would be an ideal piece to add to a PO contending team. I'd think OKC would want him bad after the multiple great games he had against them last season. The chicken feed he is making would be a nice Mejri for a 2nd rounder deal imo. Last edited by rimrocker; 11-23-2016 at 02:40 PM. They just paid Adams and Kanter. Where would Mejri fit? I think only place I can see Salah going for a 2nd would be Cleveland. They are over the tax line so his small salary helps them the most. They have some trade exceptions to get someone better but I'm not sure how much more tax they are willing to spend with the new penalties. And a 2nd from Cleveland is a glorified undrafted FA. Possibly Clippers I suppose if Speights got hurt. Last edited by Bryan_Wilson; 11-23-2016 at 03:09 PM. Last edited by Bryan_Wilson; 11-23-2016 at 06:50 PM.